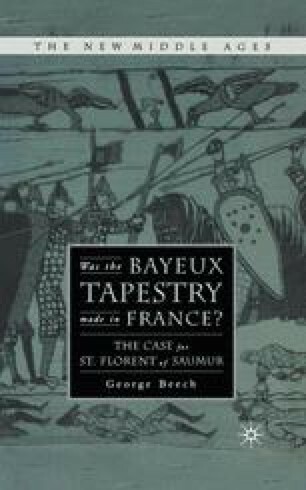 Though the Historia Sancti Florentii (HSF) provides convincing evidence for the importance of this Loire valley abbey as a center for ornamental cloth production in the eleventh and twelfth centuries, it does not so much as hint at a Norman patron having commissioned the Bayeux Tapestry there in the 1070s and 1080s. (For a possible reservation about this assertion see appendix B: Could Queen Mathilda have commissioned the Bayeux Tapestry? p. 109.) The case for this having happened rests on circumstantial evidence of other kinds and to this the argument now turns.The first of these was the personal relationship which existed between the abbot of Saint-Florent and the royal couple William and Mathilda in the years after the Conquest, a relationship centering on their mutual long-term interests and leading to the bestowal of gifts and compensations which conceivably included the Bayeux Tapestry.